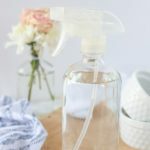 This natural homemade glass cleaner is 3 simple ingredients to clean glass and windows without streaks. 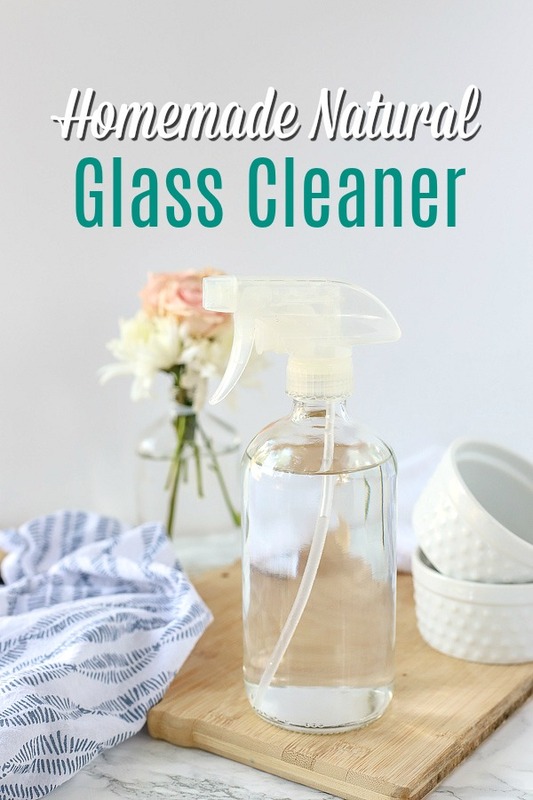 DIY glass cleaner cost pennies to make and you won’t go back to the store bought stuff. My mom always made our own homemade glass cleaner. I remember her getting out a large bucket and some newspaper and going to town on a glorious spring weekend. Obviously, spring is when you really make sure your windows are clean. Something about the open windows and fresh air really makes you want to deep clean the house. Cleaning the mirrors is an easy task for me. I hate seeing fingerprints or smudges on it. But other glass like windows is hard… Because little hands… let’s be truly honest…. mouths and tongues can reach them and get the glass all nasty in the matter of seconds. I’m not sure what it is with kids and babies about licking windows. But for some reason it is thrilling and my perfect children (insert sarcasm) love licking windows and rubbing boogery noses all over. That doesn’t even include the dog that also likes to lick and rub her nose all over the windows. Basically, this is me telling you how disgusting the glass in my house can get and which in turn tells you how awesome this DIY glass cleaner is. 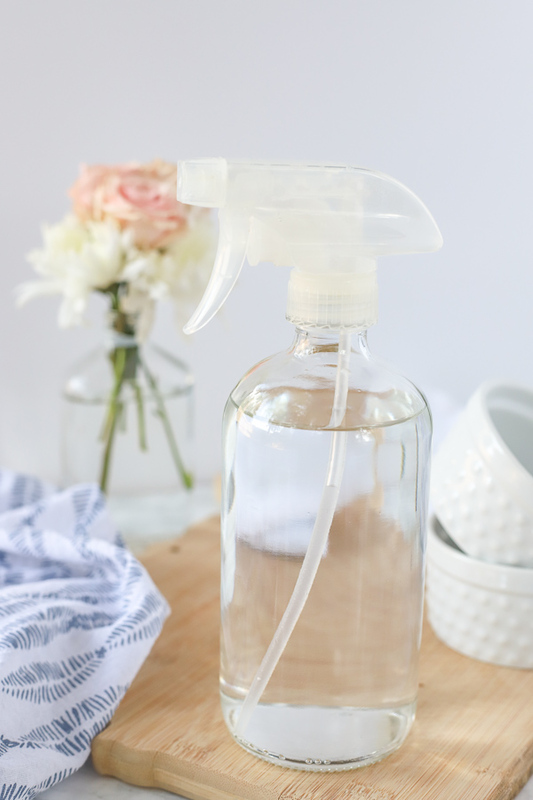 Why should you switch to natural DIY glass cleaner? The FDA doesn’t have super strict standards and they don’t even make companies disclose all of their ingredients. If you are new to the world of natural cleaners, I would recommend to start researching the cleaning products in your home. My first go to is look up the product on EWG or the Think Dirty app to see what rating of that cleaner is. Both of these apps give products a rating based on safety. I usually try to keep all my cleaners to a 1 or a 2 rating. If you don’t have access to the app when your at the store you can flip over the bottle and look at the ingredients. Now many of the ingredients you probably can’t pronounce, even more natural cleaners. If you see the word fragrance, that is a big red flag. Fragrance is a blanket term for hundreds or even thousands of chemicals and has been linked to hormone disruption and cancer. So if you see this, place the cleaner back on the shelf and slowly back away. Thankfully, this homemade glass cleaner is a simple switch that only takes a minute or so to make. You can even add pure essential oils to give it a “clean” smell. If you have hard water, you may have to use distilled water. Hard water can leave streaks on glass and mirrors. Use a towel that will not shed little fuzzies. Microfiber towels work great. If you don’t want to use rubbing alcohol you could always use vodka. Since this is a water based product use it quickly to avoid bacteria. Add essential oils that are great for cleaning like lemon, wild orange, or melaluca. Make sure to use a glass bottle when adding essential oils, because they can break down regular plastic. 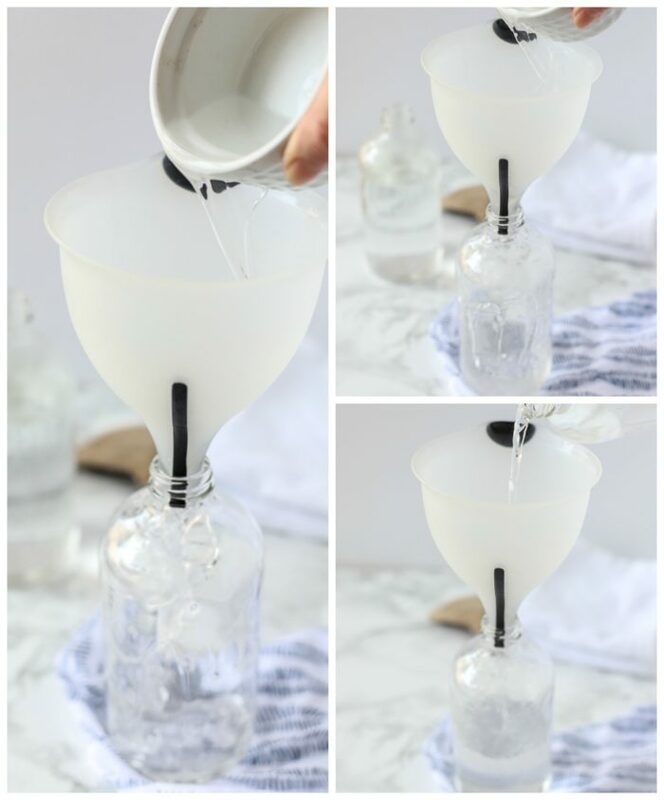 How do you make natural homemade glass cleaner? In a 16 oz spray bottle add in rubbing alcohol and vinegar. Fill the rest of the spray bottle up with water. Use distilled if you have hard water. Spray on dirty glass surfaces like glass, windows, and mirrors. Don’t spray too much. To make them extra squeaky clean, you can wipe them down with newspaper (only the black and white newspaper). What is the best homemade mirror cleaner? This one of course. Simple ingredients mixed together and sprayed on glass is a super effective way to clean mirrors. 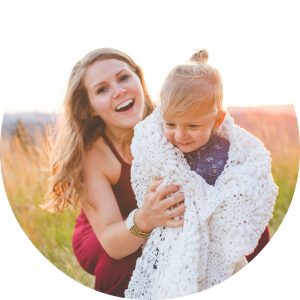 Want more natural cleaning posts? Check these out! 15 Tips for a naturally clean home– learn how to clean your house from top to bottom naturally. DIY All-Purpose Cleaner goes from the kitchen to the bathrooms. Homemade Furniture Polish is a simple natural recipe to help clean and polish wood furniture. Mix into a 16 oz spray bottle. Spray onto glass, mirrors, and windows and wipe clean. What are your favorite natural cleaners?